A barbiturate[a] is a drug that acts as a central nervous system depressant, and can therefore produce a wide spectrum of effects, from mild sedation to death. Barbiturates are effective as anxiolytics, hypnotics, and anticonvulsants, but have physical and psychological addiction potential. They have largely been replaced by benzodiazepines in routine medical practice, particularly in the treatment of anxiety and insomnia, due to the significantly lower risk of addiction and overdose and the lack of an antidote for barbiturate overdose. Despite this, barbiturates are still in use for various purposes: in general anesthesia, epilepsy, treatment of acute migraines or cluster headaches, euthanasia, capital punishment, and assisted suicide. Barbiturates such as phenobarbital were long used as anxiolytics and hypnotics, but today have been largely replaced by benzodiazepines for these purposes because the latter are less toxic in overdose. However, barbiturates are still used as anticonvulsants (e.g., phenobarbital and primidone) and general anesthetics (e.g., sodium thiopental). Barbiturates in high doses are used for physician-assisted suicide, and in combination with a muscle relaxant for euthanasia and for capital punishment by lethal injection. Barbiturates are frequently employed as euthanizing agents in small-animal veterinary medicine. Sodium thiopental is an ultra-short-acting barbiturate that is marketed under the name Sodium Pentothal. It is often mistaken for "truth serum", or sodium amytal, an intermediate-acting barbiturate that is used for sedation and to treat insomnia, but was also used in so-called sodium amytal "interviews" where the person being questioned would be much more likely to provide the truth whilst under the influence of this drug. When dissolved in water, sodium amytal can be swallowed, or it can be administered by intravenous injection. The drug does not itself force people to tell the truth, but is thought to decrease inhibitions and slow creative thinking, making subjects more likely to be caught off guard when questioned, and increasing the possibility of the subject revealing information through emotional outbursts. Lying is somewhat more complex than telling the truth, especially under the influence of a sedative-hypnotic drug. The memory-impairing effects and cognitive impairments induced by sodium thiopental are thought to reduce a subject's ability to invent and remember lies. This practice is no longer considered legally admissible in court due to findings that subjects undergoing such interrogations may form false memories, putting the reliability of all information obtained through such methods into question. Nonetheless, it is still employed in certain circumstances by defense and law enforcement agencies as a "humane" alternative to torture interrogation when the subject is believed to have information critical to the security of the state or agency employing the tactic. In 1988, the synthesis and binding studies of an artificial receptor binding barbiturates by six complementary hydrogen bonds was published. Since this first article, different kind of receptors were designed, as well as different barbiturates and cyanurates, not for their efficiencies as drugs but for applications in supramolecular chemistry, in the conception of materials and molecular devices. Sodium barbital and barbital have also been used as pH buffers for biological research, e.g., in immunoelectrophoresis or in fixative solutions. Addiction experts in psychiatry, chemistry, pharmacology, forensic science, epidemiology, and the police and legal services engaged in delphic analysis regarding 20 popular recreational drugs. Barbiturates were ranked 5th in dependence, 3rd in physical harm, and 4th in social harm. There are special risks to consider for older adults, women who are pregnant, and babies. When a person ages, the body becomes less able to rid itself of barbiturates. As a result, people over the age of sixty-five are at higher risk of experiencing the harmful effects of barbiturates, including drug dependence and accidental overdose. When barbiturates are taken during pregnancy, the drug passes through the placenta to the fetus. After the baby is born, it may experience withdrawal symptoms and have trouble breathing. In addition, nursing mothers who take barbiturates may transmit the drug to their babies through breast milk. A rare adverse reaction to barbiturates is Stevens-Johnson syndrome, which primarily affects the mucous membranes. With regular use, tolerance to the effects of barbiturates develops. Research shows that tolerance can develop with even one administration of a barbiturate. As with all GABAergic drugs, barbiturate withdrawal produces potentially fatal effects such as seizures in a manner reminiscent of delirium tremens and benzodiazepine withdrawal although its more direct mechanism of GABA agonism makes barbiturate withdrawal even more severe than that of alcohol or benzodiazepines (subsequently making it one of the most dangerous withdrawals of any known addictive substance). Similarly to benzodiazepines, the longer acting barbiturates produce a less severe withdrawal syndrome than short acting and ultra-short acting barbiturates. Withdrawal symptoms are dose-dependent with heavier users being more affected than lower-dose addicts. The pharmacological treatment of barbiturate withdrawal is an extended process often consisting of converting the patient to a long-acting benzodiazepine (i.e. Valium), followed by slowly tapering off the benzodiazepine. Mental cravings for barbiturates can last for months or years in some cases and counselling/support groups are highly encouraged by addiction specialists. Patients should never try to tackle the task of discontinuing barbiturates without consulting a doctor due to the high lethality and relatively sudden onset of the withdrawal. Attempting to quit "cold turkey" may result in serious neurological damage, severe physical injuries received during convulsions, and even death via glutamatergic excitotoxicity. Some symptoms of an overdose typically include sluggishness, incoordination, difficulty in thinking, slowness of speech, faulty judgement, drowsiness, shallow breathing, staggering, and, in severe cases, coma or death. The lethal dosage of barbiturates varies greatly with tolerance and from one individual to another. The lethal dose is highly variable among different members of the class with superpotent barbiturates such as pentobarbital being potentially fatal in considerably lower doses than the low-potency barbiturates such as butalbital. Even in inpatient settings the development of tolerance is still a problem, as dangerous and unpleasant withdrawal symptoms can result when the drug is stopped after dependence has developed. Tolerance to the anxiolytic and sedative effects of barbiturates tends to develop faster than tolerance to their effects on smooth muscle, respiration, and heart rate, making them generally unsuitable for a long time psychiatric use. Tolerance to the anticonvulsant effects tends to correlate more with tolerance to physiological effects, however, meaning that they are still a viable option for long-term epilepsy treatment. Barbiturates in overdose with other CNS (central nervous system) depressants (e.g. alcohol, opiates, benzodiazepines) are even more dangerous due to additive CNS and respiratory depressant effects. In the case of benzodiazepines, not only do they have additive effects, barbiturates also increase the binding affinity of the benzodiazepine binding site, leading to exaggerated benzodiazepine effects. (ex. If a benzodiazepine increases the frequency of channel opening by 300%, and a barbiturate increases the duration of their opening by 300%, then the combined effects of the drugs increase the channels overall function by 900%, not 600%). The longest-acting barbiturates have half-lives of a day or more, and subsequently result in bioaccumulation of the drug in the system. The therapeutic and recreational effects of long-acting barbiturates wear off significantly faster than the drug can be eliminated, allowing the drug to reach toxic concentrations in the blood following repeated administration (even when taken at the therapeutic/prescribed dose) despite the user feeling little or no effects from the plasma-bound concentrations of the drug. Users who consume alcohol or other sedatives after the drugs effects have worn but before it has cleared the system may experience a greatly exaggerated effect from the other sedatives which can be incapacitating or even fatal. Barbiturates induce a number of hepatic CYP enzymes (most notably CYP2C9, CYP2C19 and CYP3A4), leading to exaggerated effects from many prodrugs and decreased effects from drugs which are metabolized by these enzymes to inactive metabolites. This can result in fatal overdoses from drugs such as codeine, tramadol, and carisoprodol, which become considerably more potent after being metabolized by CYP enzymes. Although all known members of the class possess relevant enzyme induction capabilities the degree of inhibition overall as well as the impact on each specific enzyme span a broad range with phenobarbital and secobarbital being the most potent enzyme inducers and butalbital and talbutal being among the weakest enzyme inducers in the class. People who are known to have killed themselves with a barbiturate overdose include Charles Boyer, Dalida, Phyllis Hyman, Lupe Velez, Carole Landis, Jean Seberg, Abbie Hoffman, Felix Hausdorff, Donald Sinclair (veterinary surgeon)  and C. P. Ramanujam. Others who have died as a result of barbiturate overdose include Judy Garland, Marilyn Monroe, Ellen Wilkinson, Dorothy Kilgallen, Pier Angeli, Brian Epstein, Alan Wilson, Jimi Hendrix, Thalia Massie, Edie Sedgwick, Inger Stevens and Kenneth Williams; in some cases these have been speculated to be suicides as well. Dorothy Dandridge died of either an overdose or an unrelated embolism. Ingeborg Bachmann may have died of the consequences of barbiturate withdrawal (she was hospitalized with burns, the doctors treating her not being aware of her Barbiturate addiction). Further, barbiturates are relatively non-selective compounds that bind to an entire superfamily of ligand-gated ion channels, of which the GABAA receptor channel is only one of several representatives. This Cys-loop receptor superfamily of ion channels includes the neuronal nACh receptor channel, the 5-HT3 receptor channel, and the glycine receptor channel. However, while GABAA receptor currents are increased by barbiturates (and other general anaesthetics), ligand-gated ion channels that are predominantly permeable for cationic ions are blocked by these compounds. For example, neuronal nAChR channels are blocked by clinically relevant anaesthetic concentrations of both thiopental and pentobarbital. Such findings implicate (non-GABA-ergic) ligand-gated ion channels, e.g. the neuronal nAChR channel, in mediating some of the (side) effects of barbiturates. This is the mechanism responsible for the (mild to moderate) anesthetic effect of barbiturates in high doses when used in anesthetic concentration. Barbituric acid was first synthesized November 27, 1864, by German chemist Adolf von Baeyer. This was done by condensing urea (an animal waste product) with diethyl malonate (an ester derived from the acid of apples). There are several stories about how the substance got its name. The most likely story is that Baeyer and his colleagues went to celebrate their discovery in a tavern where the town's artillery garrison were also celebrating the feast of Saint Barbara – the patron saint of artillerymen. An artillery officer is said to have christened the new substance by amalgamating Barbara with urea. Another story was barbiturate was invented on the feast day of St.Barbara. Another story holds that Baeyer synthesized the substance from the collected urine of a Munich waitress named Barbara. No substance of medical value was discovered, however, until 1903 when two German scientists working at Bayer, Emil Fischer and Joseph von Mering, discovered that barbital was very effective in putting dogs to sleep. Barbital was then marketed by Bayer under the trade name Veronal. It is said that Mering proposed this name because the most peaceful place he knew was the Italian city of Verona. It was not until the 1950s that the behavioural disturbances and physical dependence potential of barbiturates became recognized. Barbituric acid itself does not have any direct effect on the central nervous system and chemists have derived over 2,500 compounds from it that possess pharmacologically active qualities. The broad class of barbiturates is further broken down and classified according to speed of onset and duration of action. Ultrashort-acting barbiturates are commonly used for anesthesia because their extremely short duration of action allows for greater control. These properties allow doctors to rapidly put a patient "under" in emergency surgery situations. Doctors can also bring a patient out of anesthesia just as quickly, should complications arise during surgery. 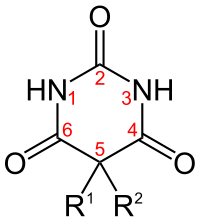 The middle two classes of barbiturates are often combined under the title "short/intermediate-acting." These barbiturates are also employed for anesthetic purposes, and are also sometimes prescribed for anxiety or insomnia. This is not a common practice anymore, however, owing to the dangers of long-term use of barbiturates; they have been replaced by the benzodiazepines for these purposes. The final class of barbiturates are known as long-acting barbiturates (the most notable one being phenobarbital, which has a half-life of roughly 92 hours). This class of barbiturates is used almost exclusively as anticonvulsants, although on rare occasions they are prescribed for daytime sedation. Barbiturates in this class are not used for insomnia, because, owing to their extremely long half-life, patients would awake with a residual "hang-over" effect and feel groggy. Barbiturates can in most cases be used either as the free acid or as salts of sodium, calcium, potassium, magnesium, lithium, etc. Codeine- and Dionine-based salts of barbituric acid have been developed. In 1912, Bayer introduced another barbituric acid derivative, phenobarbital, under the trade name Luminal, as a sedative-hypnotic. During World War II, military personnel in the Pacific region were given "goofballs" to allow them to tolerate the heat and humidity of daily working conditions. Goofballs were distributed to reduce the demand on the respiratory system, as well as maintaining blood pressure, to combat the extreme conditions. Many soldiers returned with addictions that required several months of rehabilitation before discharge. This led to growing dependency problems, often exacerbated by indifferent doctors prescribing high doses to unknowing patients through the 1950s and 1960s. In the late 1950s and 1960s, an increasing number of published reports of barbiturate overdoses and dependence problems led physicians to reduce their prescription, particularly for spurious requests. This eventually led to the scheduling of barbiturates as controlled drugs. In the Netherlands, the Opium Law classifies all barbiturates as List II drugs, with the exception of secobarbital, which is on List I. There is a small group of List II drugs for which doctors have to write the prescriptions according to the same, tougher guidelines as those for List I drugs (writing the prescription in full in letters, listing the patients name, and have to contain the name and initials, address, city and telephone number of the licensed prescriber issuing the prescriptions, as well as the name and initials, address and city of the person the prescription is issued to). Among that group of drugs are the barbiturates amobarbital, butalbital, cyclobarbital, and pentobarbital. In the United States, the Controlled Substances Act of 1970 classified most barbiturates as controlled substances—and they remain so as of September 2015[update]. Barbital, methylphenobarbital (also known as mephobarbital), and phenobarbital are designated schedule IV drugs, and "Any substance which contains any quantity of a derivative of barbituric acid, or any salt of a derivative of barbituric acid" (all other barbiturates) were designated as being schedule III. Under the original CSA, no barbiturates were placed in schedule I, II, or V, however amobarbital, pentobarbital, and secobarbital are schedule II controlled substances unless they are in a suppository dosage form. In 1971, the Convention on Psychotropic Substances was signed in Vienna. Designed to regulate amphetamines, barbiturates, and other synthetics, the 34th version of the treaty, as of 25 January 2014[update], regulates secobarbital as schedule II, amobarbital, butalbital, cyclobarbital, and pentobarbital as schedule III, and allobarbital, barbital, butobarbital, mephobarbital, phenobarbital, butabarbital, and vinylbital as schedule IV on its "Green List". The combination medication Fioricet, consisting of butalbital, caffeine, and paracetamol (acetaminophen), however, is specifically exempted from controlled substance status, while its sibling Fiorinal, which contains aspirin instead of paracetamol and may contain codeine phosphate, remains a schedule III drug. Recreational users report that a barbiturate high gives them feelings of relaxed contentment and euphoria. Physical and psychological dependence may also develop with repeated use. Chronic misuse of barbiturates is associated with significant morbidity. One study found that 11% of males and 23% of females with a sedative-hypnotic misuse die by suicide. Other effects of barbiturate intoxication include drowsiness, lateral and vertical nystagmus, slurred speech and ataxia, decreased anxiety and loss of inhibitions. Barbiturates are also used to alleviate the adverse or withdrawal effects of illicit drug use, in a manner similar to long-acting benzodiazepines such as diazepam and clonazepam. Often poly drug abuse occurs: Barbiturates are consumed with or substituted by other available substances, most commonly alcohol. 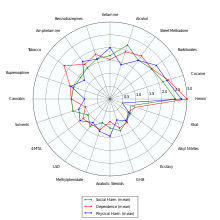 Drug users tend to prefer short-acting and intermediate-acting barbiturates. The most commonly used are amobarbital (Amytal), pentobarbital (Nembutal), and secobarbital (Seconal). A combination of amobarbital and secobarbital (called Tuinal) is also highly used. Short-acting and intermediate-acting barbiturates are usually prescribed as sedatives and sleeping pills. These pills begin acting fifteen to forty minutes after they are swallowed, and their effects last from five to six hours. Thiopental is a barbiturate with one of the C-O double bonds (with the carbon being labelled 2 in the adjacent diagram) replaced with a C-S double bond, R1 being CH2CH3 and R2 being CH(CH3)CH2CH2CH3. The Dille–Koppanyi reagent, used as a spot test for barbiturates. The Zwikker reagent, also used as a spot test for barbiturates. ^ The most often cited standard pronunciation is /ˌbɑːrˈbɪtjʊrɪt/; however, at least in the U.S., the more commonly used colloquial pronunciation is /ˌbɑːrˈbɪtjuɪt/. ^ Vaux, Bert and Scott Golder. 2003. The Harvard Dialect Survey. Cambridge, MA: Harvard University Linguistics Department. ^ "DIGNITAS". Archived from the original on 21 July 2011. Retrieved 2011-06-14. ^ Edward R. Garrett; Jacek T. Bojarski†; Gerald J. Yakatan (21 Sep 2006). "Kinetics of hydrolysis of barbituric acid derivatives". Journal of Pharmaceutical Sciences. 60 (8): 1145–54. doi:10.1002/jps.2600600807. PMID 5127086. ^ Whitlock FA (June 14, 1975). "Suicide in Brisbane, 1956 to 1973: the drug-death epidemic". Med J Aust. 1 (24): 737–43. PMID 239307. ^ Johns MW (1975). "Sleep and hypnotic drugs". Drugs. 9 (6): 448–78. doi:10.2165/00003495-197509060-00004. PMID 238826. ^ Jufe, GS (2007). "Nuevos hipnóticos: perspectivas desde la fisiología del sueño [New hypnotics: perspectives from sleep physiology]" (PDF). Vertex (Buenos Aires, Argentina) (in Spanish). 18 (74): 294–9. PMID 18265473. ^ "Administration and Compounding Of Euthanasic Agents". Archived from the original on 7 June 2008. Retrieved 15 July 2008. ^ Daniel Engber. "Why do lethal injections have three drugs?". Slate Magazine. Archived from the original on 25 July 2008. Retrieved 15 July 2008. ^ "Neuroscience for Kids - Barbiturates". Archived from the original on 16 June 2008. Retrieved 2008-06-02. ^ Stocks, JT (1998). "Recovered memory therapy: a dubious practice technique". Social Work. 43 (5): 423–36. doi:10.1093/sw/43.5.423. PMID 9739631. ^ Chang, Suk Kyu. ; Hamilton, Andrew D. (1988). "Molecular recognition of biologically interesting substrates: Synthesis of an artificial receptor for barbiturates employing six hydrogen bonds". Journal of the American Chemical Society. 110 (4): 1318–1319. doi:10.1021/ja00212a065. ^ WebMD. "Toxicity, Barbiturate". eMedicine. Archived from the original on 20 July 2008. Retrieved 15 July 2008. ^ Nau H; Kuhnz W; Egger HJ; Rating D; Helge H (Nov 1982). "Anticonvulsants during pregnancy and lactation. Transplacental, maternal and neonatal pharmacokinetics". Clin Pharmacokinet. 7 (6): 508–43. doi:10.2165/00003088-198207060-00003. PMID 6819105. ^ Löscher, W.; Rogawski, M. A. (2012). "How theories evolved concerning the mechanism of action of barbiturates". Epilepsia. 53: 12–25. doi:10.1111/epi.12025. PMID 23205959. ^ Chiara, D. C.; Jayakar, S. S.; Zhou, X.; Zhang, X.; Savechenkov, P. Y.; Bruzik, K. S.; Miller, K. W.; Cohen, J. B. (15 May 2013). "Specificity of Intersubunit General Anesthetic-binding Sites in the Transmembrane Domain of the Human α1β3γ2 γ-Aminobutyric Acid Type A (GABAA) Receptor". Journal of Biological Chemistry. 288 (27): 19343–19357. doi:10.1074/jbc.M113.479725. PMC 3707639. PMID 23677991. ^ Brunton, Laurence L.; Lazo, John S.; Parker, Keith L.; Goodman, Louis Sanford; Gilman, Alfred Goodman (2005). Goodman & Gilman's Pharmacological Basis of Therapeutics. McGraw-Hill. ISBN 978-0-07-142280-2. ^ Neil Harrison; Wallace B Mendelson; Harriet de Wit (2000). "Barbiturates". Neuropsychopharmacology. Retrieved 15 July 2008. ...Barbiturates therefore promote entry of GABA-activated channels into a long-lived open state, whereas [benzodiazepines] increase only the frequency of channel opening into the initial open state. These mechanistic studies reveal interesting details of the changes in channel gating caused by barbiturates but as yet have yielded no insights into the molecular sites of action. An additional interesting effect of barbiturates is direct gating of the channels, i.e., the barbiturates may open the channel even in the absence of GABA. This usually occurs at significantly higher concentrations than those that potentiate the actions of GABA; these concentrations also are generally higher than those required for clinically effective anesthesia. ^ Weber, M; Motin, L; Gaul, S; Beker, F; Fink, RH; Adams, DJ (January 2005). "Intravenous anaesthetics inhibit nicotinic acetylcholine receptor-mediated currents and Ca2+ transients in rat intracardiac ganglion neurons". British Journal of Pharmacology. 144 (1): 98–107. doi:10.1038/sj.bjp.0705942. PMC 1575970. PMID 15644873. ^ Franks, NP; Lieb, WR (23 November 1998). "Which molecular targets are most relevant to general anaesthesia?". Toxicology Letters. 100–101: 1–8. doi:10.1016/S0378-4274(98)00158-1. PMID 10049127. ^ a b "Barbiturates". Archived from the original on 7 November 2007. Retrieved 2007-10-31. ^ Galanter, Marc; Kleber, Herbert D. (1 July 2008). The American Psychiatric Publishing Textbook of Substance Abuse Treatment (4th ed.). United States of America: American Psychiatric Publishing Inc. p. 217. ISBN 978-1-58562-276-4. ^ "List of Psychotropic Substances under International Control ("Green List")" (PDF). International Narcotics Control Board. 25 January 2014. Retrieved 19 December 2013. ^ Schlatter J; Sitbon N; Saulnier JL (February 17, 2001). "[Drugs and drug abusers]". Presse Med. 30 (6): 282–7. PMID 11252979. ^ Allgulander C, Ljungberg L, Fisher LD (May 1987). "Long-term prognosis in addiction on sedative and hypnotic drugs analyzed with the Cox regression model". Acta Psychiatr Scand. 75 (5): 521–31. doi:10.1111/j.1600-0447.1987.tb02828.x. PMID 3604738. ^ Emedicine Health. "Barbiturate Abuse". p. 1. Archived from the original on 2 August 2008. Retrieved 15 July 2008. ^ Faulkner TP; Hayden JH; Mehta CM; Olson DA; Comstock EG (1979). "Dose-response studies on tolerance to multiple doses of secobarbital and methaqualone in a polydrug abuse population". Clin Toxicol. 15 (1): 23–37. doi:10.3109/15563657908992476. PMID 498734. ^ Coupey SM (August 1997). "Barbiturates". Pediatr Rev. 18 (8): 260–4. doi:10.1542/pir.18-8-260. PMID 9255991. ^ Hamid H.; El-Mallakh RS; Vandeveir K (March 2005). "Substance Abuse: Medical and Slang Terminology". South Med J. 98 (3): 350–362. doi:10.1097/01.SMJ.0000153639.23135.6A. PMID 15813163. ^ a b c d Smith, Roger; Bogusz, Maciej J (September 22, 2011). Forensic Science (2 ed.). Elsevier. p. 245. ISBN 9780080554259. Retrieved 21 December 2013. Look up barbiturate in Wiktionary, the free dictionary. López-Muñoz, F.; Ucha-Udabe, R.; Alamo, C. (2005). "The history of barbiturates a century after their clinical introduction". Neuropsychiatric Disease and Treatment. 1 (4): 329–343. PMC 2424120. PMID 18568113.